My weekend was delightful...nothing too exciting, but delightful nonetheless. Friday I worked until about 11 (gotta loves sales, we may not be closed but all our clients are...which makes for a short day! :)), then I met Momma in to do a little shopping and lunch! We went to The Puffy Muffin...how have I lived in Nashville for over 6 years and never been there? And the desserts...oh my gawd! This is only 2 of the 5 windows....dangerous for a pregnant girl...verrrry dangerous! 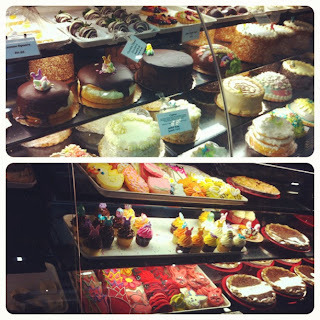 PS, Mom - I am still daydreaming of those damn petit-fours! We did some shopping for her house and I found these adorable new square chevron place mats in navy/white...how cute are they?! Also pictured, this absolutely fabulous onesie I bough at the Moms with cameras class the other night. I got really excited about these place mats because with a square table you can only get square or round place mats...and I have not been able to find cute ones in a while...these however, too cute! LOVE! 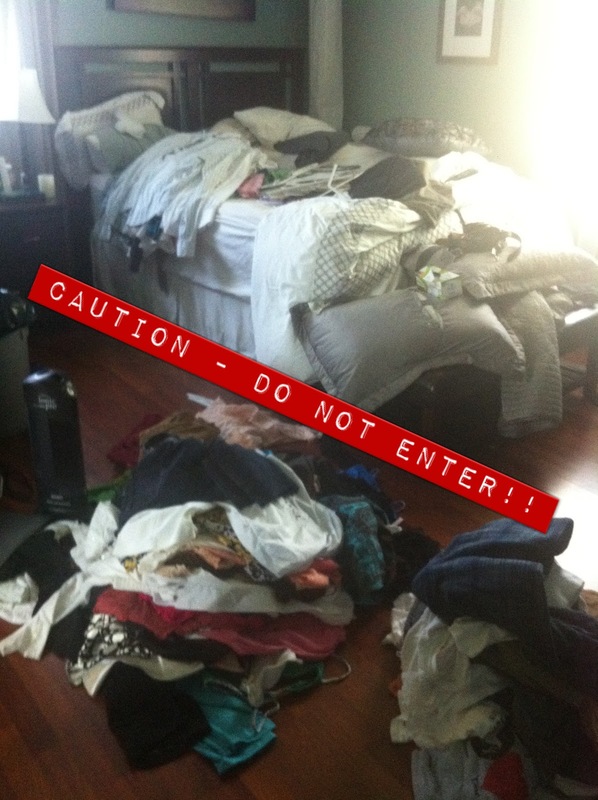 Saturday, I woke up and immediately got into Spring Cleaning/Nesting mode....my task-our bedroom, closet, and bathroom. 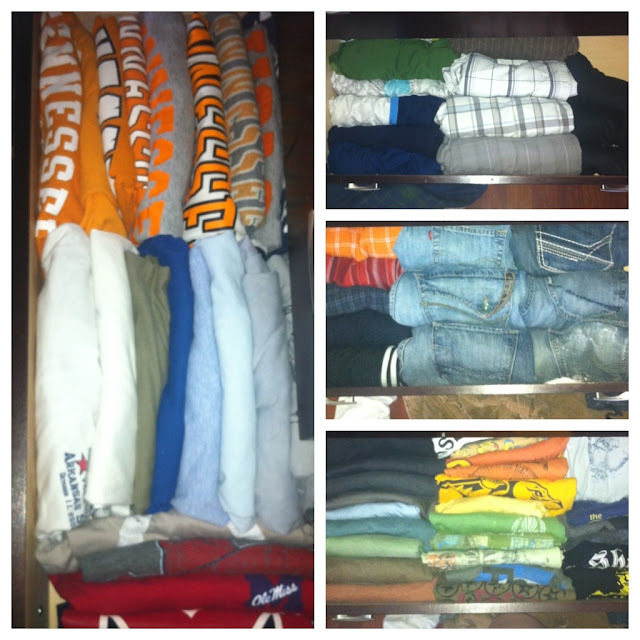 The pic I sent to The Hubs of his pretty, organized, clean drawers! So 7 hours, 4 1/2 massive bags to goodwill, and 2 trash bags later and it was all clean, organized, color-coordinated, and pretty! Saturday night The Hubs grilled out some burgers and I put my feet up! 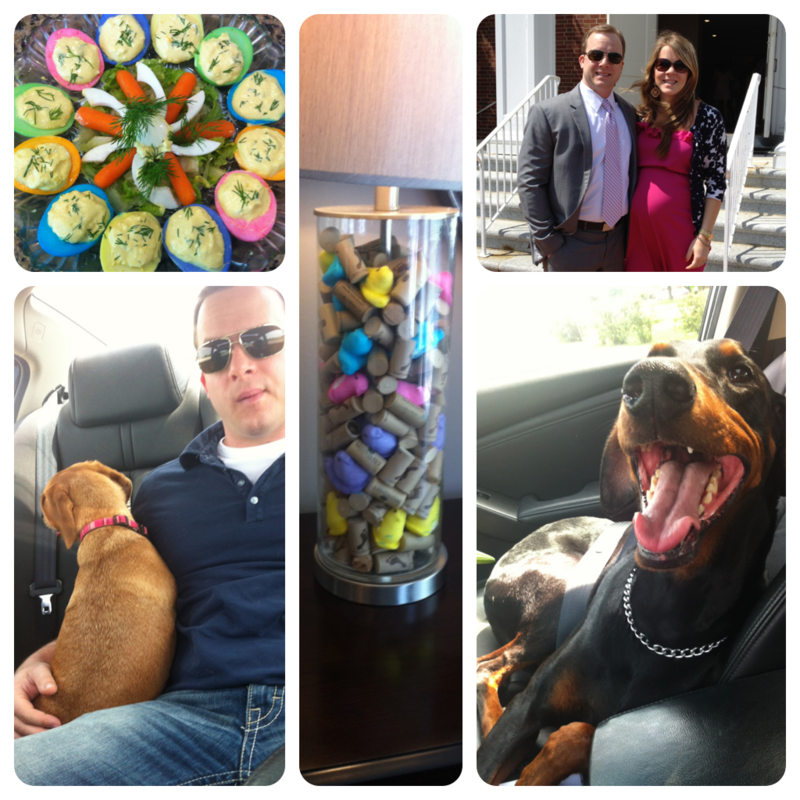 I was excited about this Easter as it was the first one The Hubs and I were able to go to our church! We always got to is Grandmothers but since we celebrated with her last weekend we were able to stay in Nashville and ahead our Church services...AAAAAAAAAAAAnnd Momma and Daddy were able to join us! I loved being at church and seeing all the little kiddos in their Easter dresses and suits, so precious! 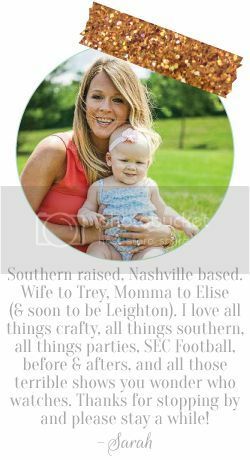 Just made me think that next year Elise will be almost 10 months old!! Crazy!! First....the colored deviled eggs from pinterest Momma made, in the middle, her fun little peeps decor, on the right me and The Hubs after church (I look huge in that dress!). Bottom left and right, our pups heading to Mimi & Papas (aka, momma and daddy) for lunch. Otto decided he was going to ride shotgun...with his seat-belt on of course...so The Hubs got in the back with Maylie...she rode like this the whole way...I think she was pouting because Otto was up front... ha! The spread of amazingness that is Momma's cooking! Not pictured, a fabulous spinach salad and orange angel food roll cake...think an orange dreamsicle...it was divine! It was a fabulous weekend with lots accomplished! Hope yours was fabulous too!! Now on to conquer this 4 day work week...yes, 4 day since 2 of my very bestest friends are coming in town on Thursday night!!!!!!!!!!!!!!! I am in LOVE with those placemats!! Where did you find them again?? great pics, looks like a great weekend! All the food pics look so good! And I love the wine corks and peeps - so cute!! Omg! Busy, busy weekend! I love all the decorations for Easter! And that onsie-- Adorbs! 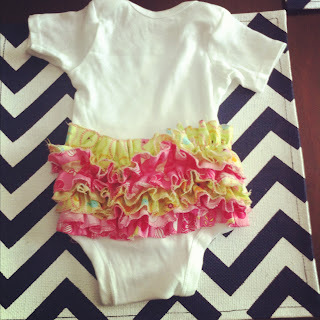 That onesie for baby girl is TOO cute!! 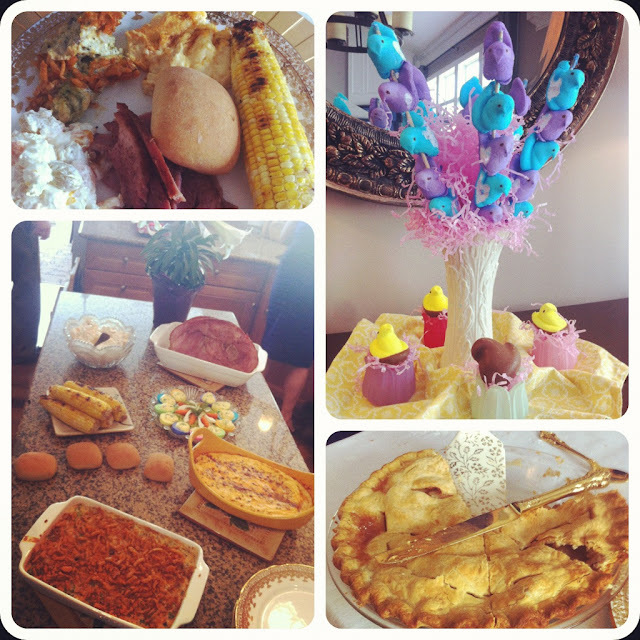 LOVE the easter decor and the eggs are so fun!! Those desserts have my mouth watering!! JEALOUS!! haha love the Peeps flowers... cute idea! I love the puffy muffin. They have the best cookies!